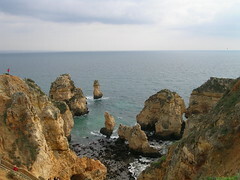 The Alentejo is Portugal’s largest region – covering just over a third of the country’s mainland. The exact borders have moved over the years with various reorganisations but historically the Alentejo is the area lying to the south of the Rio Tejo and to the north of the Algarve, stretching from the Atlantic coast to the Spanish border. It’s predominantly a rural region with few towns of any size – and a shrinking population. Despite occupying 34% of the Portuguese mainland, the Alentejo is home to only about 760,000 – equivalent to roughly 7.2% of Portugal’s total population of around 10.5 million people. But although the Alentejo has lots of wide empty spaces, it also contains plenty of culture, from the World Heritage status architecture of Évora to some of the finest military fortifications in Europe. 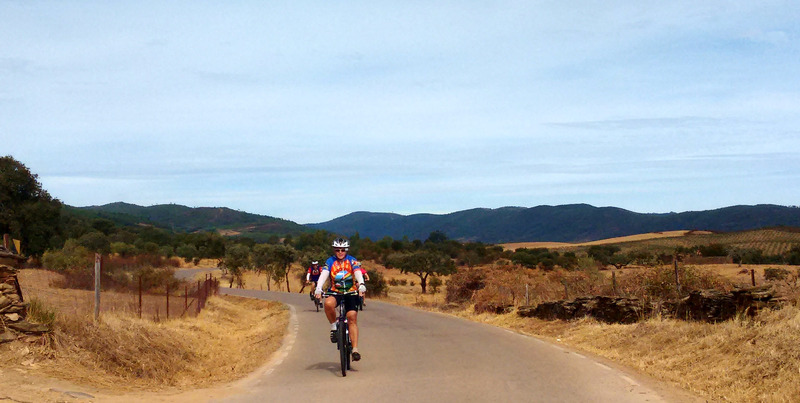 Read on for more information on the region or scroll down for details of rides and routes in the Alentejo. L: The Atlantic coast at Almograve. M: The main square in Evora. R: The frontier castle at Marvao. The Alentejo is predominantly rural – much of it rolling farmland dotted with cork oaks and olive trees. The plains around Beja and to the west of the region are mostly covered with fields of wheat and other crops. Other parts have miles of cattle pasture dotted with trees and there are also large areas covered with vines – Alentejo wines are some of the best in Portugal. The Alentejo is known for its birdlife – from storks and eagles to colourful bee-eaters, hoopoes and many other smaller species. In early spring (March to April), carpets of wild flowers also bring some vibrant splashes of colour to the region’s pastures. The area is also full of historic towns and castles – particularly towards the border with Spain. Many towns haven’t grown much in modern times so it’s not unusual to find yourself standing on the battlements looking out over open country. There are castles for all tastes. Elvas – which stands almost within sight of the Spanish city of Badajoz – is home to some amazing 17th century fortifications that are among the most extensive and best-preserved in Europe. At the other end of the scale, villages like Marvao and Monsaraz are more like mediaeval eyries. Personally, I love the Alentejo for cycling. Some of the main reasons being: quiet roads, wonderful scenery, lots of castles and great towns for wandering round, plus there’s some good food and wine to be had. Even better – as far as I’m concerned – is the terrain. Most of the Alentejo can be described as ‘rolling’. Which means there are enough hills to make it interesting but not so many that you spend hours plodding up great big inclines. There are a couple of downsides. One is the heat. It gets seriously hot in the Alentejo in the summer – temperatures regularly reach well above 40ºC in July and August. For more comfortable temperatures, I’d recommend visiting from mid-September (at the earliest) through to early June (at the latest). Any time from June through into September and it can be sweltering. 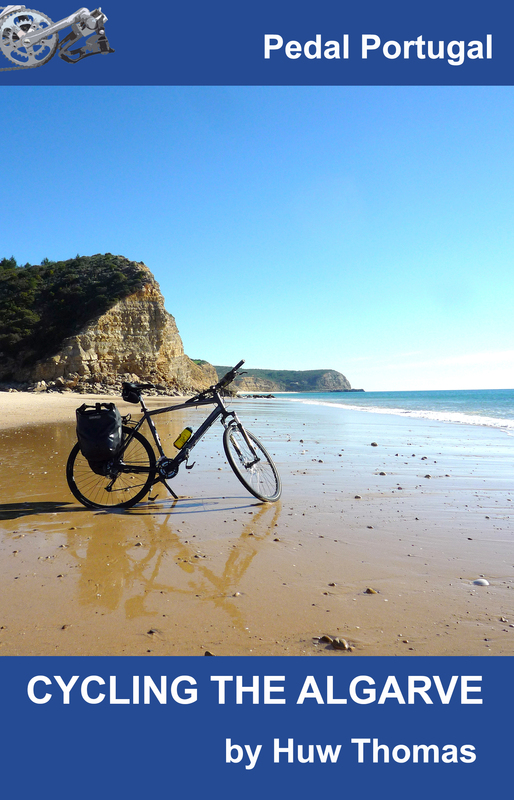 I’ve visited the Alentejo in the winter and cycled across it in February. It can get cold and you can get wet periods but they generally don’t last too long and you can also get beautiful sunshine for day after day. The other problem is the lack of roads. This is a very underpopulated area of Portugal and as a consequence there are large parts where there are few roads. This means that planning circular routes sometimes means you don’t have a lot of options. However, the lack of people also means that what look like major roads on a map actually have very little traffic compared to other countries. Other than motorways (which you won’t be on anyway! ), the only really major road in the Alentejo is the IC1 from Faro up to Lisbon, which gets a lot of lorry traffic that’s avoiding motorway tolls. Further east, you can be riding on main N and E routes without much problem. Obviously the more minor roads will be quieter but don’t think you need to avoid the main roads completely. On very minor roads, the surfaces might be an issue – I have found one or two country roads that are little more than cobbles with a patchy layer of tarmac! 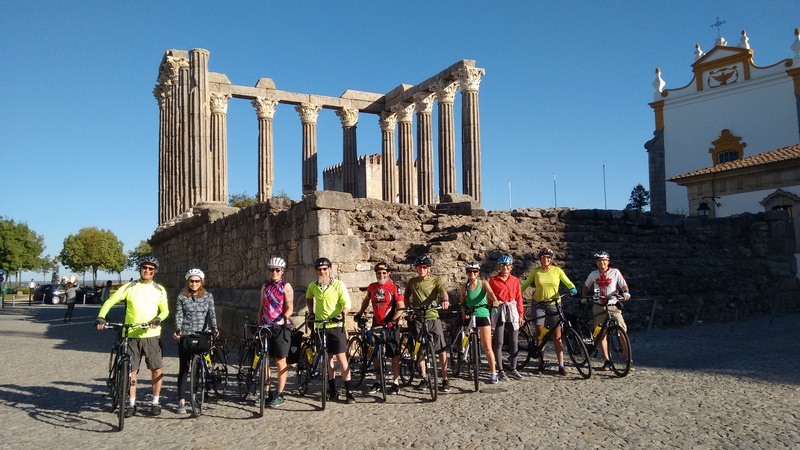 Alentejo panorama: A good day’s ride through a rolling rural landscape, beginning and ending in the marble town of Estremoz and taking in the hilltop castle at Evoramonte with its amazing panoramic views of the Alentejo plains. 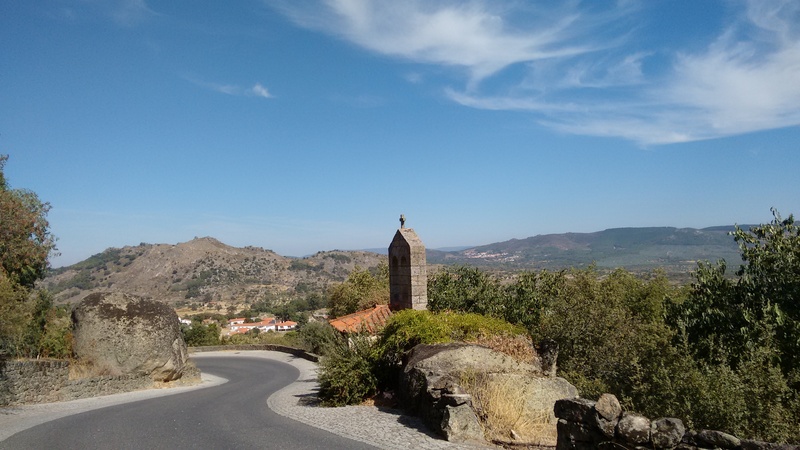 Cork & carpets: A gentle 54km (33m) circuit along quiet roads to the north of Évora, visiting the pretty little town of Arraiolos – famous for making the best carpets in Portugal. Cabo Sardao: A relaxing ride along gentle country roads and a visit to a dramatic cape where storks nest high above crashing Atlantic waves. Alentejo Circuit: A five or six day circuit that takes in some of the region’s most interesting towns and varied scenery. Alentejo to Algarve: A quick inland route to get you south from Évora to Loulé. Quiet roads and spectacular views feature. Border Castles Tour: Starting in Évora, this route takes you towards the border with Spain and then north via some stunning hilltop towns and castles. 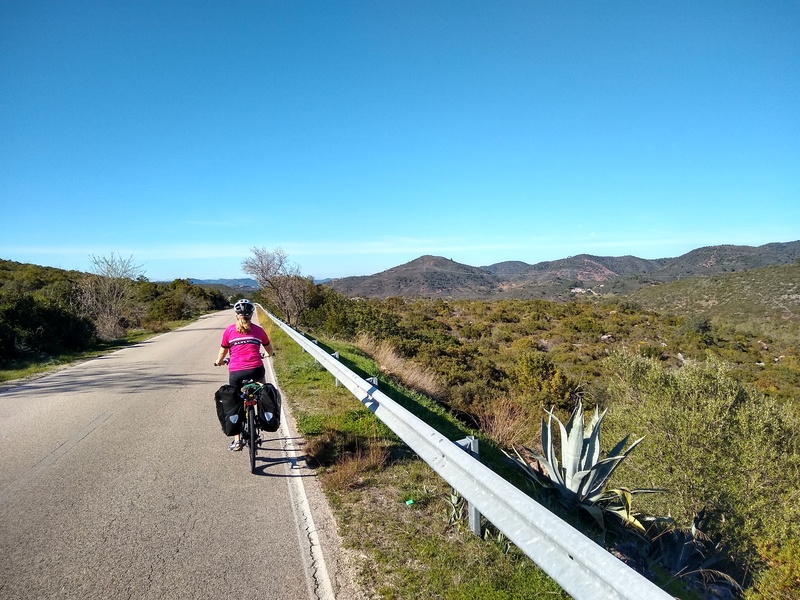 Central Bypass: If you want to avoid cycling through Lisbon (not a great experience), this route gets you to Évora from the Atlantic coast at Peniche. S2N Lagos to Vila Nova: A coastal route from the Algarve to Vila Nova de Milfontes on the Alentejo coast. S2N Vila Nova to Évora: Two long days of fast riding to get you from the coast to Évora via Beja. S2N Évora to Lisbon:Heading back to the coast and up to the capital via Setubal.